Get set for an RS explosion. The high performance models that used to be a relative rarity will play an increasingly important role in Audi’s future product line-up. It begins with the stealth vehicle you see here. In mid-2011 we were surprised when, during the international Audi Q3 launch, company boffins sprung a surprise, offering us a spin in a prototype, with the innocuous label of Q3 2.5. Three years later, this would hit the local market as the RS Q3, a title that carries rather more kudos. We really liked this understated vehicle then, its effortless progress accompanied by an offbeat five-pot lilt. Now that the Audi RS Q3 is here, we can report that little has changed since it first emerged from the skunkworks. Clearly the vehicle then was close to production ready. And the first RS Q vehicle from Audi is unlikely to be the last.Of the Q3 2.5 we said the five-potter ‘delivered serious thrills’, and ‘brought out the attack dog in this all-paw urban animal’. The RS Q3, like the TT RS, is all about the powertrain, make no mistake. The prototype was developing 228kW, using a detuned version of the TT RS five-pot screamer. Happily that mad-dog powerplant has made it to production undiluted, and offers a decent serve of torque to boot, 420Nm from 1500 to 5200rpm. 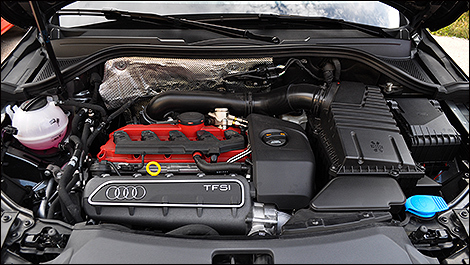 The sonorous 2.5-litre TFSI engine is still good for over 300bhp and the RS Q3 is claimed to run 0-100 in the low fives. And that it did, with a best run of 5.09sec. We’ve only had two SUVs break the 5.0sec barrier, and they were almost twice the price of the RS Q3. The Audi transmits its power via a seven-speed S-tronic transmission, top gear giving it long legs and a highway fuel use figure of 6.9L/100km. Complementing the solid power is a torque ‘curve’ that’s pool table level over much of the rev range, meaning it really doesn’t matter whether you’re at 2000 or 5000rpm; there’s either generous or masses of urge on tap. A decent rev spread too, the final flurry available from 4500-6700rpm. Despite useful pull coming on strong from low engine speeds, it’s difficult to refrain from revving this unit because the more it spins the more wonderful it sounds. That’s especially true in Dynamic drive select mode when the exhaust flap opens. At moderate revs it gives the most satisfyingblat on each upshift, so short-shifting is no hardship either. That penta-pot warble is ever present in the RS Q3. It’s more refined than ribald, but on song it makes every overtaking manoeuvre seem like a chase scene in an action movie. Hit the gas and there’s a pregnant pause as the turbo winds itself up, and then there’s this surge, like you’ve caught a bigger wave than expected, and around three seconds later, it’s all over. Anything completing 80-120km/h in under 100m is not hanging around. The five-star rated operatics are almost a little unexpected, for the top Q3 really doesn’t look bonkers at all. It may go like a mad snake – it’s the smallest SUV to give the 0-100km/h run a five-second fright – but you’re hard pressed on first glance to differentiate it from the entry-level Q3. Rather like the toning back of the exhaust roar, Audi didn’t want the visuals too dramatic, more quietly arresting. It rides 25mm lower than standard Q3s, there are subtle blisters to the guards, its honeycombed grille is finished in gloss black paint, and a quattro sign sits discreetly between enlarged air ducts. 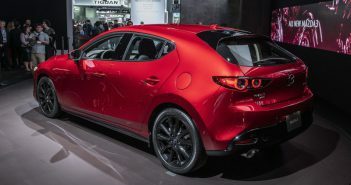 A slimline diffuser and roof end spoiler mark out the rear, but there’s just the single exhaust – evidently there wasn’t room for any more plumbing. About the most emphatic visual statement is the optional 20-inch wheel set our tester came on, shod with 255/35R20 PZeros. So it’s Q for quick and sounds heavenly. But the show doesn’t end there. Upgraded brakes do sterling service, the eight-piston calipers biting into 365mm discs up front and they bring the alpha dog to heel without fail. No fade, no smoke, just great retardation and a solid response from the big sports pedal. Wavy discs reduce unsprung weight, aid cooling and look smart too. 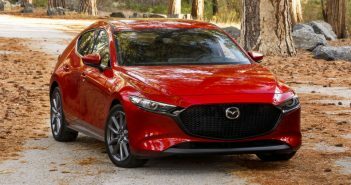 On dynamics, don’t be surprised that this is the least adept RS yet; more it reflects the fact that SUVs are the fastest growing segment and a small proportion of potential buyers want something not too big or bulky that goes like stink. That said, the RS Q3 is not corner shy. With stiffened suspension, quattro permanent all-wheel drive shuffl ing torque north and south and an electronic diff lock, plus a healthy serve of sports rubber, this is a compact SUV that thinks it’s a hot hatch. Why there’s even an ESC sports setting and launch control! It can maintain stellar progress through challenging roads. Sports suspension keeps the quickest Q on an even keel, and only when you stretch the considerable limits of its PZeros does the front, which supports 58 per cent of total weight, start to call it a day. The RS helm is not a strong communicator but it is direct and being electric the weighting varies depending on mode. What we also admired about progress was the ride decorum. The cabin is subtly sporty as well. 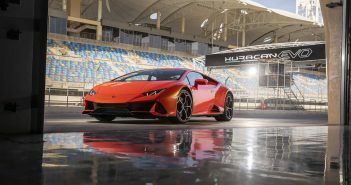 On the equipment list are heated and power-adjusted sports seats, leather clad and diamond stitched, and a be-paddled D-shaped multifunction steering wheel with a thick leather-padded rim. Between the instruments, you can dial up a digital speed readout, and there’s a turbo boost gauge and lap timer if you want to do a spot of monitoring. Special sills and pedals, a central pop-up screen detailing sat nav and reversing camera images, dual zone air, xenon lights and parking sonar each end are all there. No smart key, but stop/start features. This is roughly the size of a compact car inside, so there’s room for two adults in the rear, providing front seat passengers aren’t oversized. The hold is compact too at 350L, though quickly extends to over 1200L with seat-top releases. The Q range is one of Audi’s pillars. 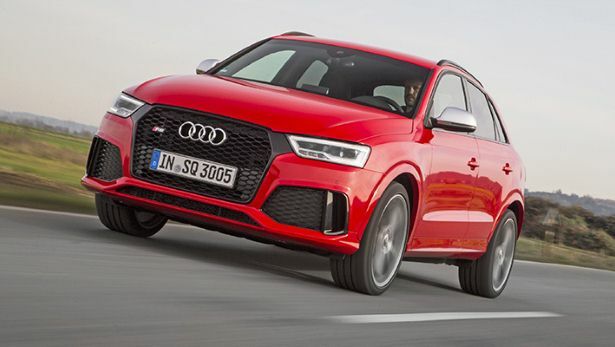 While A3 models will contribute almost one-quarter of Audi sales locally in 2014, the Q3, 5 and 7 ranges account for one-third, the Q5 being the most popular. 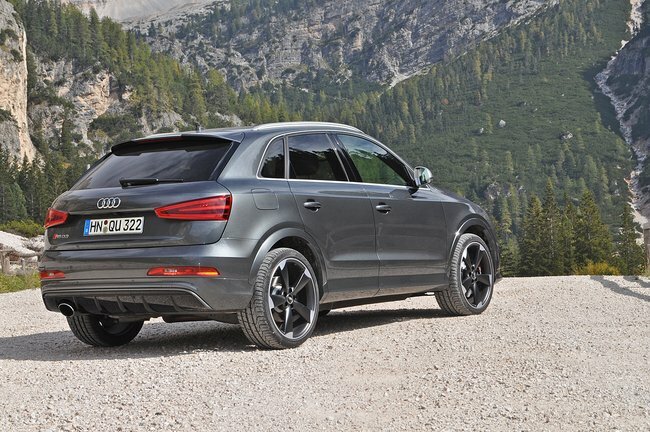 With three variants in the Q3 range, prices span from $59,900-$104,900.